An elderly woman who was knocked to the ground during a drug arrest has won a decade-long legal battle against West Yorkshire Police. Elizabeth Robinson was injured after being trapped under two "sturdily built" police officers and a suspected drug dealer in Huddersfield in 2008. Mrs Robinson, who was 76 at the time, argued that the police had breached their duty of care towards her. The Supreme Court said the force was now liable to pay her damages. West Yorkshire Deputy Chief Constable John Robins said the force acknowledged the court's decision. "We regret that an innocent member of the public was caught up in this incident, for which we apologise," he said. "Officers have to make difficult split-second decisions every day and public safety is their primary consideration." 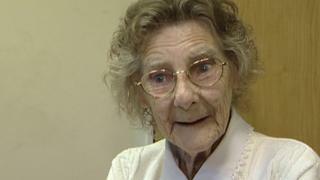 Mrs Robinson, who is now 86, was described in court as "relatively frail" at the time of the incident. In a written judgement, Supreme Court judge Lord Robert Reed said Mrs Robinson was walking on Kirkgate when she was caught up in a tussle to arrest a man who had been seen dealing drugs in a park. The men knocked into her and they "all fell to the ground with Mrs Robinson underneath", Lord Reed said. It was found that the officers involved "had acted negligently" as they could have chosen a safer opportunity to attempt to arrest a man who was at risk of attempting to escape. Speaking after the ruling, Mrs Robinson said she had been accused of it being "her fault" for standing where she was when the tussle took place. "In the past I've felt down in the dumps, yet today I feel exhilarated," she added. "It's never been about the money, I want the two police officers to come to my house and apologise deeply to me."